Michael Evans has been the driving force of all that AMSI has delivered in schools education. Michael came to AMSI in 2004 with a distinguished record in mathematics teaching. 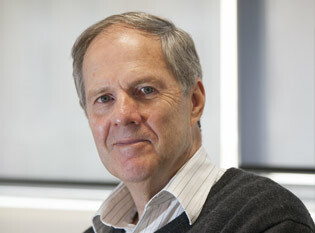 His reputation as a leader in curriculum development and assessment in Victoria, as an outstanding textbook author and as a major contributor to the Mathematical Olympiad and Australian Mathematics Trust activities, set the standard for AMSI’s place in school mathematics in Australia. As managing author for the ICE-EM Mathematics program, together with Garth Gaudry, Janine McIntosh and an extensive team of authors, Michael produced the series of high-quality, highly successful mathematics textbooks, which formed the pillar of AMSI’s School Education program. More recently Michael has brought his mathematical and educational expertise to the development of online teacher and student resources, leading a number of major writing projects to support the Australian Curriculum. The Teacher Content Modules are unique in addressing the needs of teachers whilst maintaining a high standard of mathematical rigour. Michael’s role with ACARA in developing the Australian Curriculum Foundation to Year 10 and leading the Year 11 and Year 12 Curriculum has been essential in ensuring that mathematicians and statisticians had input and that the new curriculum had mathematical and statistical integrity. Michael’s contribution to AMSI and to mathematics in Australia has been outstanding. Teachers and students are mathematically richer for the enormous body of work he has developed.